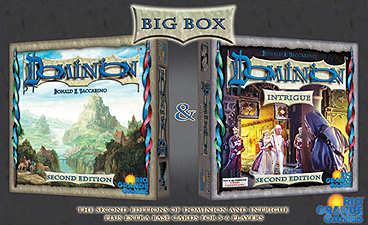 This box includes Dominion Second Edition and Dominion: Intrigue Second Edition. You are a monarch, like your parents before you, a ruler of a small pleasant kingdom of rivers and evergreens. Unlike your parents, however, you have hopes and dreams! You want a bigger and more pleasant kingdom, with more rivers and a wider variety of trees. You want a Dominion! In all directions lie fiefs, freeholds,and fiefdoms. All are small bits of land, controlled by petty lords and verging on anarchy. You will bring civilization to these people, uniting them under your banner. But wait! It must be something in the air; several other monarchs have had the exact same idea. You must race to get as much of the unclaimed land as possible, fending them off along the way. To do this you will hire minions, construct buildings, spruce up your castle, and fill the coffers of your treasury. Your parents wouldn't be proud, but you grandparents, on your mother's side, would be delighted. This is the first addition to the game of Dominion. It has 300 cards, with 26 new Kingdom cards. Three are victory cards that do thing for you, underlings that give you a choice as to what they do, and a variety of other cards. Dominion: Intrigue is an expansion, and cannot be played by itself; to play with it, you need the Basic cards and rulebook (Dominion provides both). Dominion: Intrigue can also be combined with any other Dominionexpansion you have. We hope you enjoy this expanding world of Dominion! This is the second edition of Intrigue. Six cards were replaced and one added compared to the first edition. It no longer has Basic cards and thus is no longer a stand-alone expansion: to expand to 5-6 players, use Base Cards.